To be honest at 2010hrs you would have thought it would have been a no goer! 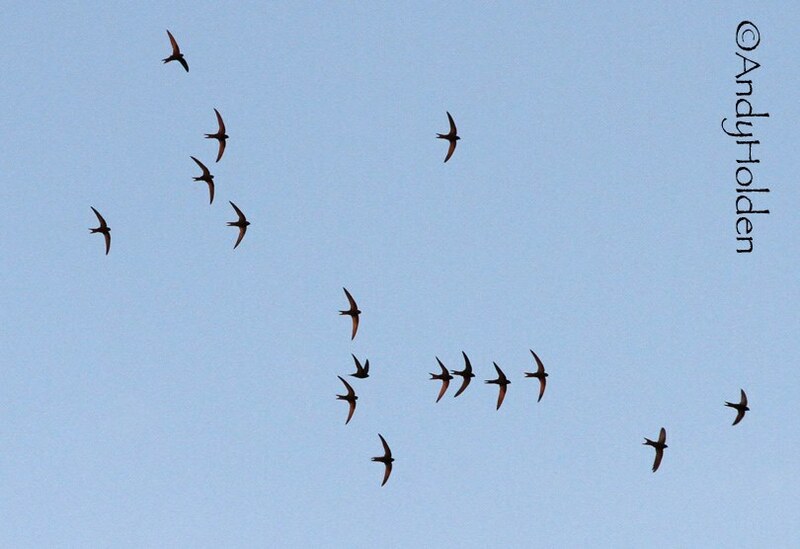 with heavy rain showers, but by 2015hrs it cleared up and we managed to have some great Swift Watching. 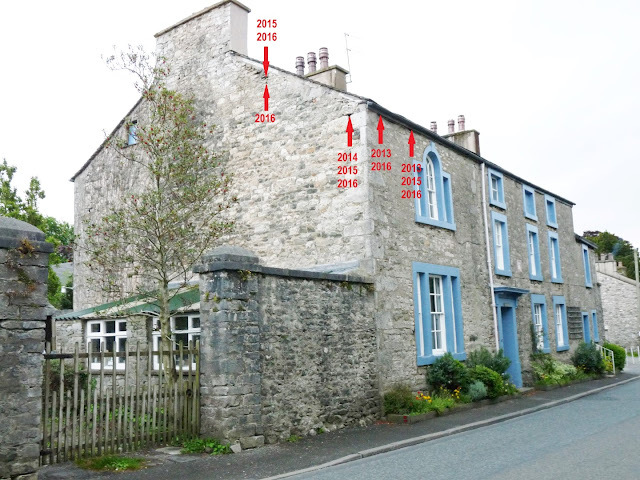 It started whilst observing the Cottage on the Post Office row, and we witnessed a bird enter the eaves at a totally different point to the first site, so it does look very much like we do have another nest site bringing it to two sites here, which is the norm on this building. Moving on to the rear of the Royal Cottage annexe and we finally observed the larger hole at the top being used this year, although it was our first sighting, Hugh had actually seen birds entering this site earlier in the week. Also tonight we saw birds entering all the other holes on this area as well as the site on the return wall. 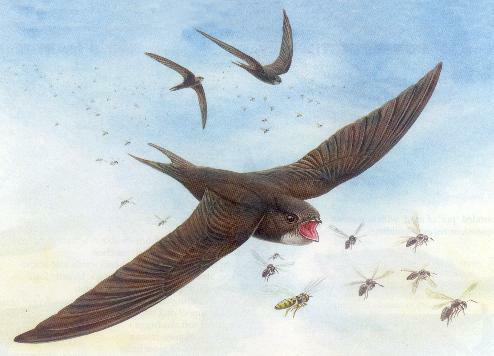 Total birds seen at once in the sky totalled 18 birds with lots of small screeching parties. It was getting darker quickly and so me moved on to the Coaching House and Manor House. We got some good results here with two more sites added on the North facing gable wall. We confirmed the old site to the corner where the drainpipe is was being used, also a new site about 8ft along the gutter eaves from the far corner (this is a new site in total), also the site above and to the left of the small porthole window was seen to be used. We are still hoping that the front elevation site between the two windows on the left maybe being used but so far not accounted. A new site was witnessed on the North facing gable at the Manor House with the birds using a small triangular hole just below the well established site which is close to the third purlin up the rake of the roofline. Our party were suddenly alarmed to take a look to the skies were a very large party of mixed Swifts and House Martins were present and all screeching and clicking with alarm, we noticed a large bird of prey emerging out of the cloud of birds having just seized either a Swift or Martin (not sure which) and which it held firm within its talons and then made off to the South West following the line of Main Street. The large bird was not immediately identified and some were left wondering was it a Peregrine or was it a large female Sparrowhawk. The bird by far too large for a Hobby. On exit the bird was seen to triple wing flap glide and triple wing flap again before the glide. Although at first it seemed appropriate for the Falcon, I did notice it seemed more rounded to the outer edge of the wing which made me then give thought to the female Sparrowhawk. I guess we will never know for sure. So tonight having recorded five new for the year sites, this brings our total to 22 nest sites so far. This is the highest number of nest sites we have ever recorded in any previous years. Observers tonight were: Reg Hesketh, Branwen Kilburn, Hugh and Sue Miles and Bryan Yorke. 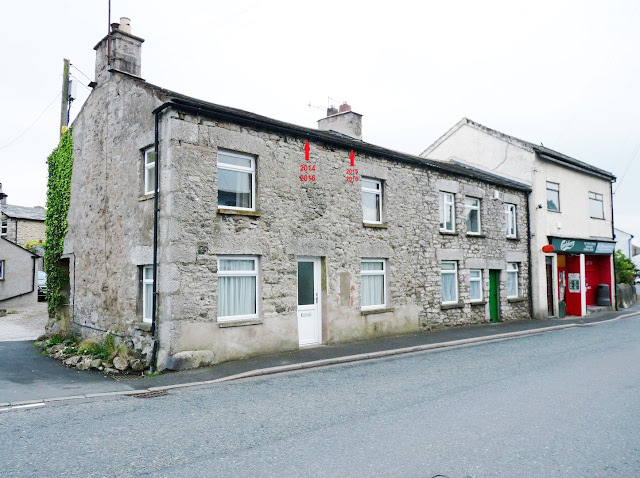 The red marker on the left above the door is the new site recorded this year, although the site does have history with it being used also in 2014. The larger hole site to the top left was confirmed being used last night - plus the other three here were also witnessed being used as well. Last night we recorded another new site being used (shown above with red arrow and marked 2016), a very tiny triangular slot and just below the already established nest which is located above it and next to the timber purlin close to the verge. Also birds were seen to use other sites on the Manor House.